Food Wishes Video Recipes: Cauliflower!!!!! When was the last time you were really excited about cauliflower in a recipe? Never? That is correct. We would have also accepted, “Are you kidding?” and, “What?” However, my friend Carl Hanson put together a great collection called, “Undercover Cauliflower…Dressed Up In 10 Delicious Disguises,” which may change all that. Several of these ideas, including our own Cauliflower Pizza Crust, could generate actual excitement, or at the very least a raised eyebrow. If you think your heart can handle it, click here and all will be revealed. Enjoy! I love Cauliflower. One of my favorite recipes is “Karfiol mit Bröseln” (cauliflower with breadcrumbs), which is popular in Austria. It is just what it says: Cauliflower (boiled or steamed) topped with spicy butter-toasted breadcrumbs. Easy, healthy, and delicious! 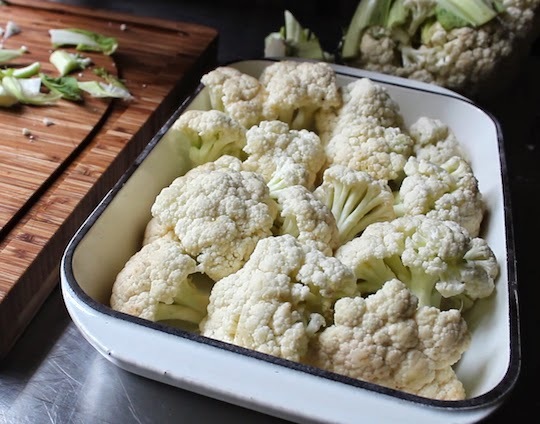 I've had people tell me they don't like cauliflower, while I'm making your Atlantic City Cauliflower candy recipe. Then they eat it and proclaim that they still don't like cauliflower, except that way. That's the only way they'll eat it. Love that recipe! I like roasted cauliflower a lot. Cut the head into two-bite sides pieces, coat with olive oil (or molten butter, if you're into that sort of thing), and generously salt and pepper them. In a 190C/375F oven for 35-45 minutes. My name is Camden, I am 15 and have dreams of becoming a chef. I binge watch your videos everyday and get inspired to cook and create art through cooking. I am very serious about cooking and pursuing the culinary arts and you help drive that dream, so thank you for sharing your knowledge. I was wondering if you had any tips for me as I persue a career in the culinary arts. I'm not sure if you check the comments on your blog, but I figured that I would have a better chance of you seeing my comment on here. You are such an inspiration to me and I really hope you respond to this comment with more knowledge to share with me. P.S. This comment sounds super serious and formal, but IRL I'm the opposite.